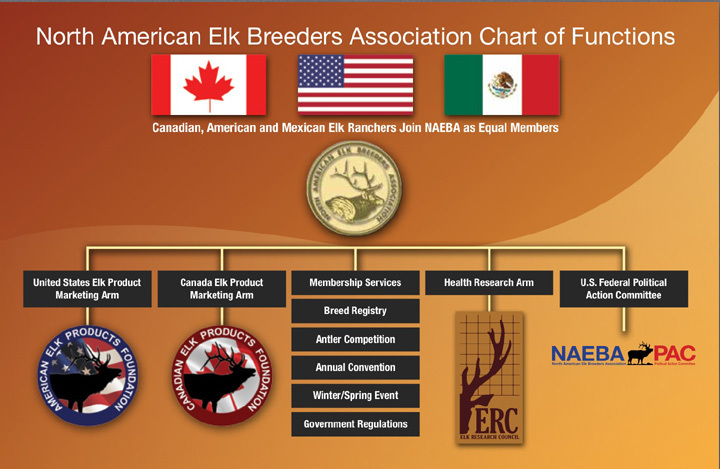 North American Elk Breeders Association :: What is NAEBA? The North American Elk Breeders Association, or NAEBA, is a 501(c)(5) non-profit organization, founded to promote and protect the elk farming and ranching industry. The primary goal of the association is to educate its members and the general public about the rewards and opportunities that are available through participation in the industry as a legitimate diversified agricultural pursuit. NAEBA is recognized by federal authorities as the voice of the industry, and enjoys mutually benefiting association with the Federal Farm Bureau, as well as Allied Industry Status in the United States Animal Health Association. NAEBA is also a member organization of the American Cervid Alliance Leadership Council and Canadian Cervid Alliance. NAEBA serves its members in many ways, including the maintenance of the only purebred elk registry on the continent. A great deal of information is distributed to the membership through bi-monthly publications, including two full color journal magazines, that address all aspects of the elk industry from pertinent issues affecting the elk industry to the education of proper management and breeding practices. NAEBA has connected organizations that specialize in specific areas of interest to the industry. The Elk Research Council (ERC) is a 501 (c)(3) foundation that focuses of the health research and education. The American Elk Products Foundation (AEPF) is a 501 (c)(3) foundation that focuses on the promotion and education of domestic elk products. The Canadian Elk Products Foundation (CEPF) is a non-profit in Canada to focus on the promotion and education of domestic elk products. NAEBA's publications provide regular reports on ERC, AEPF and CEPF activities. Every summer, NAEBA holds a combined annual convention and international antler competition event for the membership to gather for networking and the discussion of the latest animal health and herd management techniques. Elk ranchers from across North American bring hard antler and velvet antler to the antler competition to receive official scores as they promote their breeding stock and bloodlines. NAEBA has just celebrated its 25th year of serving all owners and investors in the elk industry.